Gujarat University, India is starting a Semester in India program from Fall 2007. A number of Indian universities are offering such programs to the Foreign Universities providing opportunities to foreign students to study in India and come closer to its culture and environment. But Gujarat University shall make a difference in running these courses. This ultimately shall not only develop awareness about our country but also allow the University to make a Global presence. Gujarat is the work place of Mahatma Gandhi and the land still vibrates with his philosophy and trends. Gandhi�s birth place, his Ashram and major institutions establishes by Mahatma Gandhi are in Gujarat only. The courses are designed keeping Indian and International scenario in mind. They offer a wide range of cultural, philosophical, traditional and contemporary knowledge and expose the students to this unique land called India. The course outlines attached herewith are expected to give interested students a general sense of the topics that will be covered in each area/subject. Each course will be of 30 hours duration and will be completed in ten weeks. Besides lectures, there will be a variety of aids-film/documentary, screenings, demonstrations by artistes, outings to sites and performances of relevance, guest speakers, discussion groups � that will be used to enable the foreign students to grasp as many nuances of each subject as is possible in the limited time available. Had been affiliated with Research and Development of Telemedicine and Tele education in the R&D unit. Worked as advisor to ISRO and UGC for Tele education. Affiliated with literary forums and All India Radio for literary pursuits. Widely traveled and participated in a number of National and International seminars, round tables and conferences including in Russia, Nepal, Malaysia, Paris, Mauritius, Shreveport, Sri Lanka, Cyprus and Egypt. More than 35 papers and articles published world wide in literary, technical, Spiritual and educational journals. A new meaning has emerged of the idea of geographical reach of a country as Diasporic communities spread across the world. India has a Diapospra which is 20 million strong and is to be found in almost every part of the world. There is an urge in NRIs to come closer to their country and understand it better. 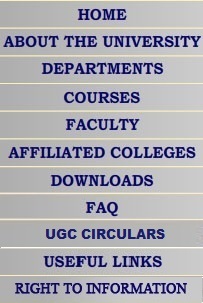 To cater to this need Gujarat university presents a bouquet of courses to cater to the specialized needs of NRIs. It serves the wider goals of binding external relationships because cultural affinity provides a useful platform for other actions. It shall not only bring NRIs closer to India but shall also allow a meaningful role towards Indian economy. To get admission please send an application by snail/ Email mentioning what promoted you to opt for these courses.